The surprising sounds of a late evening in Mogadishu: surf on the beach, laughs of revellers, clinking of cups and glasses, oaths of harassed waiters and the soft melodies of the oud of Aweys Kabanle. Kabanle, a 45-year-old former dressmaker turned musician, is playing traditional Somali music at the luxury Mogadishu Beach View hotel at the city’s Lido to a smartly dressed audience in one of the world’s most dangerous cities. “This is Mogadishu. We laugh and sing. We play music. Music is for peace so we no longer live in fear,” Kabanle says, sipping a cappuccino. There are few cities with contrasts as stark as those of Mogadishu. Swollen by hundreds of thousands of people displaced by famine, drought and conflict in rural areas, its outlying districts resemble a vast refugee camp. Authorities are incompetent, corrupt or simply absent. It is seven years since the Islamic militants of al-Shabaab withdrew but many streets bear the scars of more than two decades of incessant warfare. Mogadishu’s inhabitants have long been known for their resilience, but a new wave of activists, entrepreneurs and artists are now trying to improve their city. Two years ago, Kabanle survived an al-Shabaab gun attack and suicide car bombing close to where he now performs every evening. The attack left at least 10 dead, including three of Aweys’s friends. The oud player was forced to jump over the wall of the hotel where he was playing to escape. Despite the ongoing violence in the Somali capital, the economy is growing, hundreds of expatriates are returning from the west or African nations, scores of colleges are opening to cater for the young population and there is growing investment from the diaspora. Estate agents thrive: a two-storey house can cost nearly £100,000. Mogadishu has hosted a TEDx conference. Ahmed Hassan Sheikh decided to return to Mogadishu from Kenya a year and a half ago. 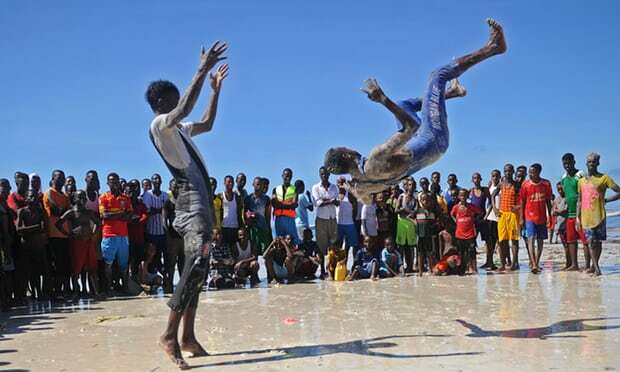 He started his own arts company inside the fortified Mogadishu airport complex, where thousands of diplomats, United Nations staff and regional troops from the African Union stabilisation force are based. There is no shortage of demand for Sheikh’s paintings. “I do not need to fight with a gun. I have a powerful pen with which I draw my feelings. I believe through it I can bring change. I can make Mogadishu peaceful,” the 48-year-old artist says. His paintings call for young people to take up pens and books instead of arms, to warn against illegal migration and its devastating effects on Somali families. Other drawings recall life in old Mogadishu before the civil war, a time when the city was known as the most beautiful city in Africa. “When people see my artworks of former Mogadishu and how it used to be like, they appreciate how peaceful and prosperous Mogadishu was,” Ahmed says. Then there is Ubaxa Caasimadda (Flowers of the City), a group of students who, 18 months ago, set out to smarten scruffy city streets and mark roads to increase public safety. They started with the safest roads such as those near the presidential palace, because some had already received death threats from al-Shabaab. “When we started, we did not even know what will come out. It was just, go and do and then see. We knew the dangers we were facing but we took that risk,” says Amira Mahad Abdulle, a 24-year-old university student. Abdulle wears a burqa to conceal her identity and does not respond to phone calls from unknown people for her safety. “There are a lot of threats coming in but I try to stay safe. I do not fear. I want to serve Mogadishu,” she says. The group decided to act “because nobody else was willing to do it” and the government in Mogadishu is focused on fighting al-Shabaab. “We could not sit behind and wait for someone else to do this for the people of Mogadishu. We are the youth of this country and we decided to stand up for it,” Abdulle says. So far the group has painted dozens of zebra crossings and have planted flowers on pavements. “We are committed. We were born in Mogadishu and we want to help our city become developed, beautiful and safe like other cities in the world,” Isse Hassan Ibrahim, a 23-year-old typographic graduate, says. In the last 18 months, US and Somali forces have intensified the battle against al-Shabab, though without achieving decisive success. Last week US officials said a new airstrike killed 14 militants. Though the increased military activity has weakened the extremists, it also led to more civilian casualties. Kabanle believes his country will soon be at peace. “Somalia is no longer a war zone. It is a love zone,” he says, pointing to a group of young men and women sitting on the warm white sand of Mogadishu’s beach.